The Labyrinth? Why, you must be mythtaken! 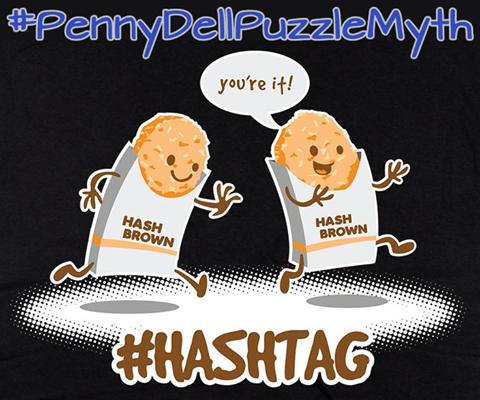 For years now, we’ve been collaborating on puzzle-themed hashtag games with our pals at Penny Dell Puzzles, and this month’s hook was #PennyDellPuzzleMyth, mashing up Penny Dell puzzles with anything and everything mythological! Greek, Roman, Egyptian, Celtic, Norse, whatever! Examples include: Helen of Troy-Angles, Odin and Around, and Heads and Heads and Heads and Heads and Heads and Heads and Heads and Heads and Heads and Tails (because it’s a hydra). Roll the Dionysus before he Looses his Tiles! He had Two at a Time all night! Riddle Me This in the Middle of the Road: “Which creature walks on four legs in the morning, two legs in the afternoon, and three legs in the evening?” asks the Sphinx guarding the route to the city of Thebe. Spell and Score: In retribution for Minos the King of Crete’s failure to sacrifice a white bull Poseidon sent him, Poseidon ordered Aphrodite to cast a spell on Minos’ wife, Pasiphae, to fall in love with the Cretan bull; they mated, and their offspring was Minotaur. Have you come up with any Penny Dell Puzzle Myths entries of your own? Let us know! We’d love to see them!